We’ve provided an overview here of each of the functions of our program and the benefits to your company. Keeping and monitoring statistics is a vital part of properly managing your organization. We’ve created an incredibly simple way for you (and your employees) to create and input statistics that monitor what’s going on with the various parts of your organization. 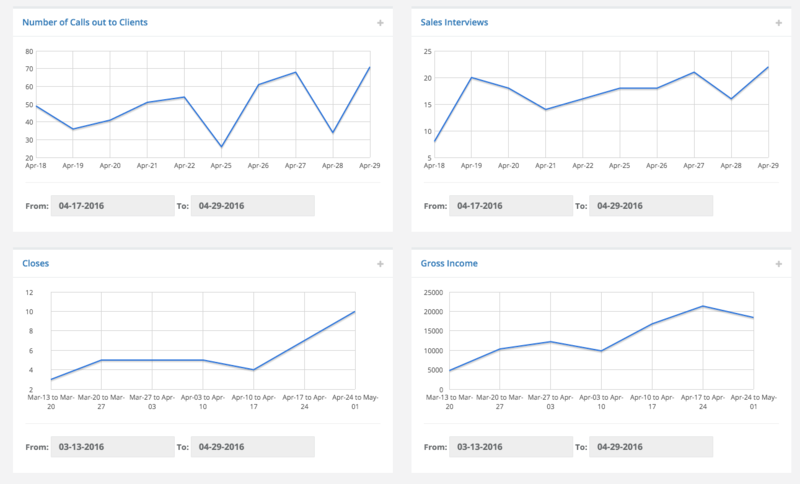 Create daily, weekly and monthly statistics. Access the statistics to any part of your organizations anytime you want. Find out which areas are not producing as much as they should and which are. Be able to assign conditions based on statistics and help any area in need of assistance rapidly. Your employees can enter in what condition they are applying based on their statistics and the correct condition formula for that will automatically show up on the screen. You can set up these formulas being sent to the appropriate executives to be checked to make sure they align with other parts of the organization. A way to stay organized and ensure all your executives and staff are aligned is to employ the use of proper battle plans. 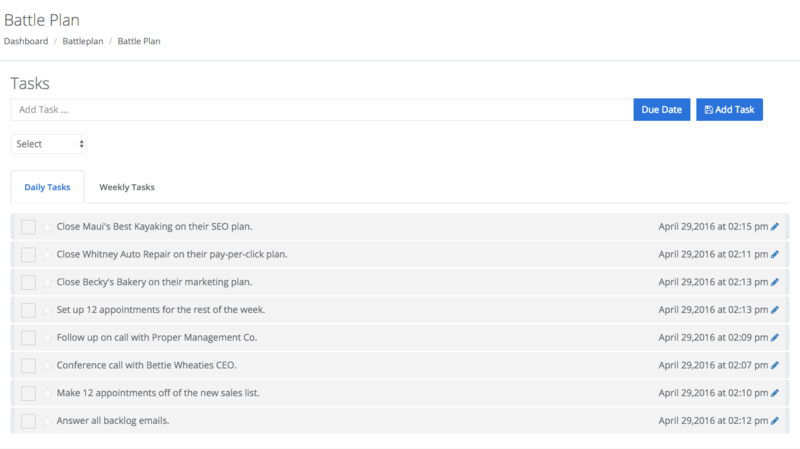 With this system you can easily add battle plan steps (tasks) and your executives can not only ensure the battle plans align with the overall company strategy but check on these steps throughout the day to ensure the staff are staying on target. Since there is a section for weekly tasks as well as daily tasks, you can additionally ensure the daily battle plan steps are still in alignment with the weekly steps. As an executive this gives you a whole new way of managing, and as an employee it allows you to stay organized, focused and productive. 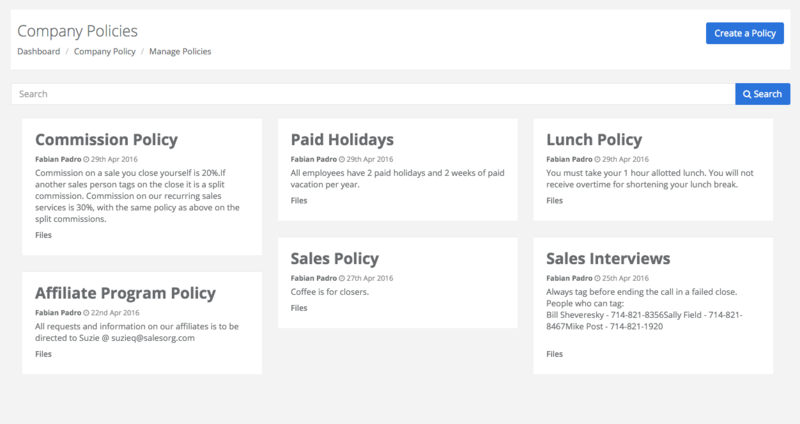 You will have an entire section dedicated to company policies. You can mark and edit who can see each policy to ensure they are going to the right people and edit and delete policies as necessary. This way the overall policies of the company, as well as the policies of each division/department are clear and written down to create harmony and alignment amongst all employees. The Organizing Board is a vital part of maintaining sanity in your organization. 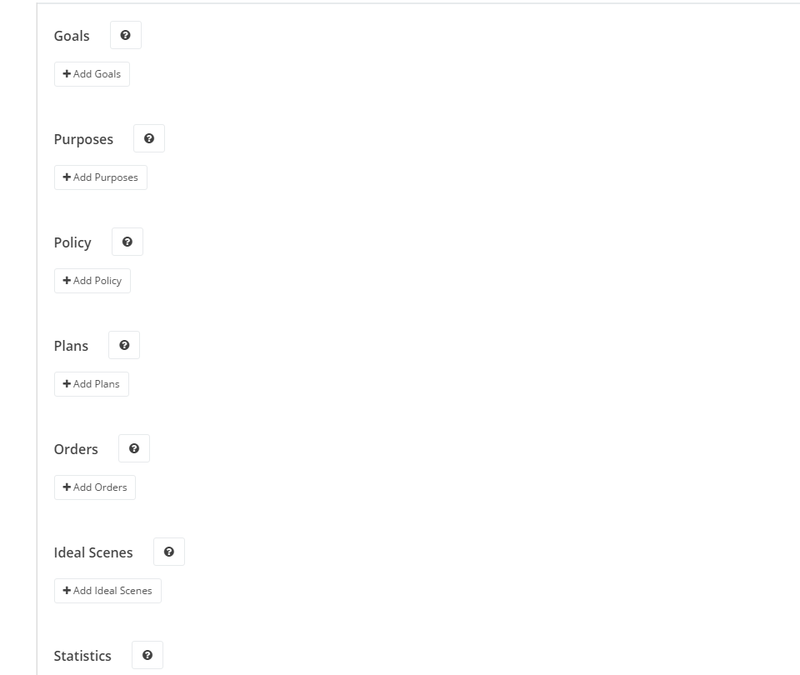 We have created a way to build an Organizing Board that clearly defines command channels, divisions, departments, sections, functions and products of each. 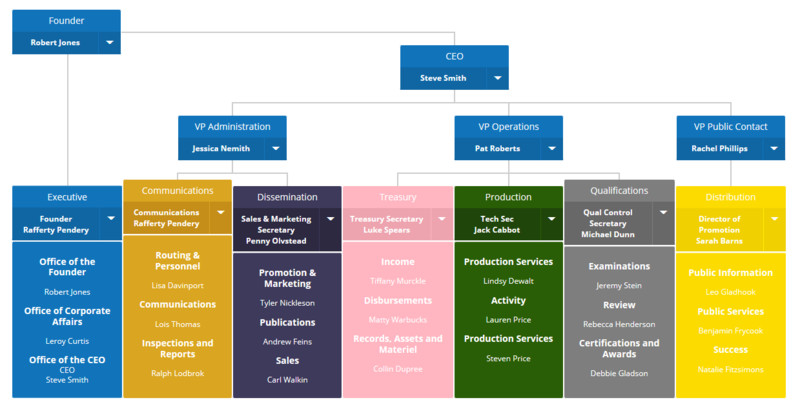 You can tailor this board any way you need to based on your company structure and needs. Having this posted with all your staff able to access it will eliminate the confusion on who is supposed to do what, who reports to who, and as mentioned above, keep everyone aligned with the purpose of the organization. Another vital tool is the Admin Scale. Write your Valuable Final Product for your company and use the admin scale to create long or short term plans to execute that VFP to achieve your Goals and Purposes. You can even assign Program targets to your employees. Upon completion of each target they will be required to fill out a Compliance Report with exactly what was ordered, what was done, and attach the evidence for your review. 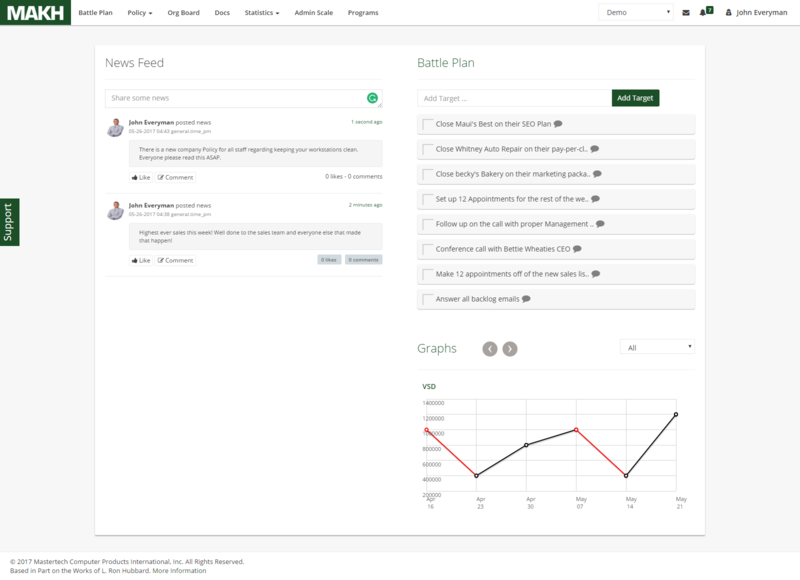 The dashboard will give you an overall view of tasks, statistics and can be used as a way to keep everyone up to date on any company news.